Home > EV > On yer bike, barista! In what turned out to be a serendipitous meeting, the team behind the Velopresso project, Amos Field Reid and Lasse Oiva, first crossed paths at the Royal College of Art (RCA) in 2010, while studying for their masters in product design. During their second year, Amos and Lasse were presented with a project brief that had a bicycle at its heart. Going beyond using it purely as aform of transport, they had to come up with a product, and a viable business proposal, that used the bicycle in a city environment. At the time, cycling was experiencing a huge surge of interest all around the world. But it was another trend the pair were also passionate about, also in the midst of a period of growth in popularity, that formed the core of their idea. Coffee. For their project, Amos and Lasse decided to build a compact and mobile, pedal-powered, coffee shop; the Velopresso. At the concept’s heart would be sustainability and the potential alternative energy can offer, as the pair had strong views on the role designers play in developing sustainable solutions and encouraging behavioural change. 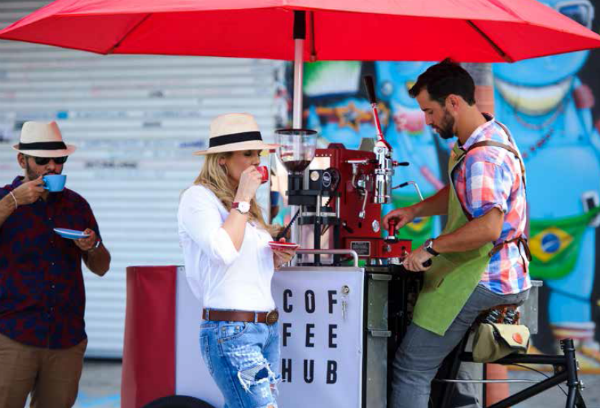 The traditional approach to producing mobile coffee carts is to combine a series of off-the shelf components that have not been designed specifically for the application. They do the job but are always a compromise. Existing solutions required electricity, needing bulky, heavy batteries and inverters. This requirement adds weight and volume, compromising the size and manoeuvrability. Pedal-power minimises the carbon footprint and eliminates that extraneous power generation equipment. This situation gave Amos and Lasse real potential to develop a new and exciting concept — an electricity-free mobile café — but it also meant they had to start with a blank piece of paper and develop every element of the project from scratch. With Amos and Lasse’s business proposal based on selling their machine to their customers as a business opportunity, additional design criteria came into play. The Velopresso had to allow the user to produce enough coffee to make it viable. As a result, they established 300 drinks a day as their target. It also had to be a high-quality machine and needed to be easy to maintain, so their customers could spend their time making coffee not maintaining the equipment. The Velopresso had to be manoeuvrable and small enough to fit on cycle paths as well as roads, which limited the overall size. And all of this had to be delivered at a price that made the Velopresso a competitive option. But above all, the Velopresso had to be able to produce great coffee. The key to the quality of a brewed coffee is the grounds used to make it, and their quality is affected by how they are ground. Hand grinders are slow, but the large, professional burr grinders, the type used in most coffee shops, are electrically powered. This requirement became one of Amos and Lasse’s first design challenges, to create a professional quality, pedal-powered, grinder. With nothing like it on the market for inspiration, a huge amount of time, effort and money went into designing the grinder and the transmission mechanism that allowed it to be pedal powered. But it was an important step as the team knew it was key to the success of the overall project. “We have been able to translate 100 revolutions per minute (rpm) at the pedals, toup to 400rpm at the burr. This capability make sour solution as efficient and effective as the electrical grinders used in the best coffee shops in the world. And yet it is easy to operate, just as precise, and electricity-free. You don’t need to be a competitive cyclist or even particularly fit. At the end of the day, users know they have done some exercise, but it’s not like an intensive hour in the gym,” Amos explained. Although cargo trikes existed they were notan option for the Velopresso as they could not be adapted to meet the ergonomic, structuraland engineering requirements of the project. So Amos and Lasse also had to tackle the question ‘How do you make coffee when sitting on a bicycle?’. To establish the answer they made ergonomic test rigs and ran studies to help develop a design that would be perfect forthe Velopresso. With the trike and coffee grinder designed, the team needed a coffee machine. As Amos and Lasse started contacting coffee machine manufacturers, they came across Fracino, who were interested in their innovative proposal, and keen to help. Within a few weeks, Amos and Lasse had designed a compact prototype ‘lever’ espresso coffee machine with the Fracino design team, and they had it built in Fracino’s Birmingham factory to their exact specification. It was perfectly proportioned for their platform and ran from a small multi-fuel stove that could be powered by camping gas and had the potential to use bio-fuel. The prototype was a success, and they had delivered their project on time. 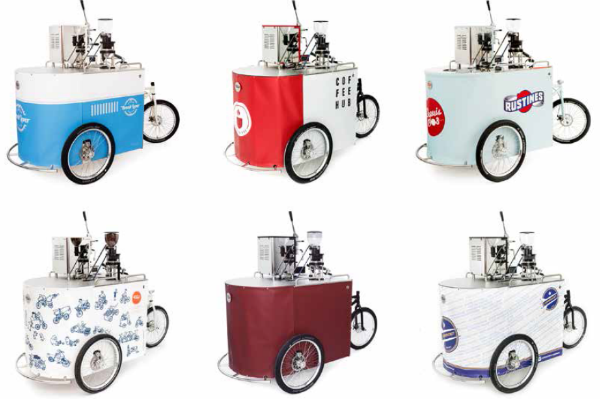 Amos and Lasse’s coffee trike ran throughout the RCA’s two-week graduate exhibition and then news of the project started to spread: fast. Interested parties started getting in touch and enquiries grew and grew. Before long they had more than 1,000 inquiries from 90 countries. What was the end of their assignment, was, in fact, the beginning of a journey neither of the designers expected to be on when they started their course. 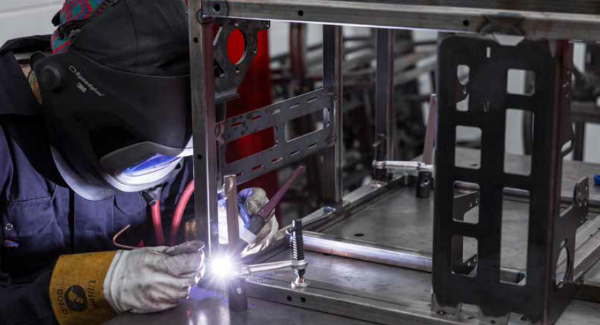 The majority of projects developed on design courses don’t live beyond the end of the course, and if they do, they are nearly always sold to established manufacturing businesses as design concepts. Industrial designers very rarely self-produce their work: it is considered too risky. Acknowledging the complexity of their design and its hybrid nature, Amos and Lasse realised there wasn’t an existing company that could produce it to the specification and high-end quality their product demanded. Fracino’s coffee machines were perfect, but they couldn’t make the trike. No bicycle manufacturer could produce the transmission they had designed. There was no other answer. They had to do it themselves. It was a daunting task to take the prototype to a manufactured product. Perhaps luckily, as it may have put Amos and Lasse off, they didn’t fully appreciate what it was going to take. So many concepts within the design — the transmission, the grinder, the frame — would have been big manufacturing projects in their own right. And they had to develop them all. Based on what they had learned from their prototype, almost every aspect of the Velopresso had to be redeveloped to make it viable for production — the frame, the wheels, the grinder and everything in between. As Amos and Lasse were taking on the project themselves, funding was tight, and the pair had to be incredibly resourceful. Initially, they were carrying out all the development work in shared spaces in London. Then, in late 2013, Fracino stepped in again and offered them space in its Birmingham factory. This move meant the team could assemble their first three Mk1 production models in a professional environment and with support from the Fracino team. The three trikes had been pre-sold and, in spring 2014, they were shipped to customers in Canada, France and London. It was a huge milestone for the duo; they had turned a proof of concept into a fully manufactured product. Taking their prototype to production had taught the team a massive amount, and their first three customers were giving them valuable feedback. So, Amos and Lasse continued to develop the design to arrive at a Mk2 production model that they intended to produce in volume. After moving into a dedicated industrial unit, with the capacity to build up to 80 units a year, they officially opened to orders in September 2014. That winter was spent developing the sophisticated tooling needed to batch manufacture the frames in-house, and Amos and Lasse began production of the Mk2 Velopresso in January 2015. 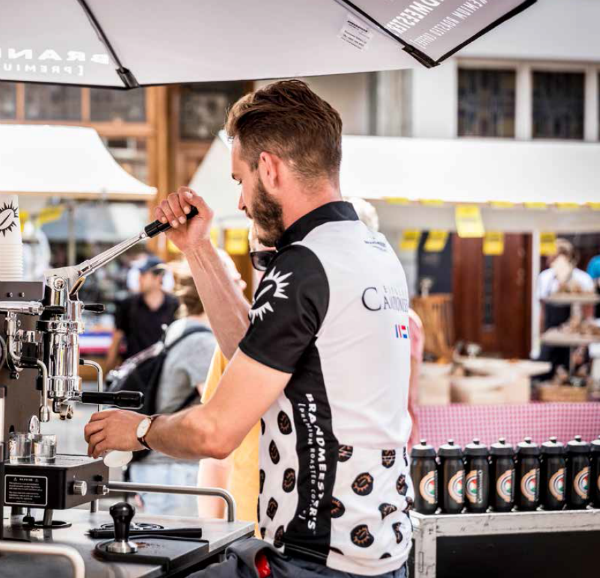 The production version of the Velopresso was finally launched at the Bespoked bicycle show in April 2015 where the team won the inaugural Constructors Award. Amos and Lasse have now sold coffee trikes to customers in 11 countries, and they continue to develop and fine-tune the product and the 250-plus unique components designed specifically for it. Today, Amos and Lasse are continuing their journey and cementing their position as an up and coming manufacturer of innovative, sustainably focused products; the team are working on several new projects built around the principles behind the Velopresso. A bar bike with a pedal-powered cocktail and smoothie blender is in the works, and later this year Amos and Lasse will launch their new Velopresso Cart, a push-along version of the trike that still offers pedal-powered coffee but at a lower price point. The cart is mounted on industrial castors and easily wheeled from a trailer to a festival pitch or from a cafe onto the street. “Not all cities are suited to riding a coffee trike, plus some of our customers were looking for a lower cost option. 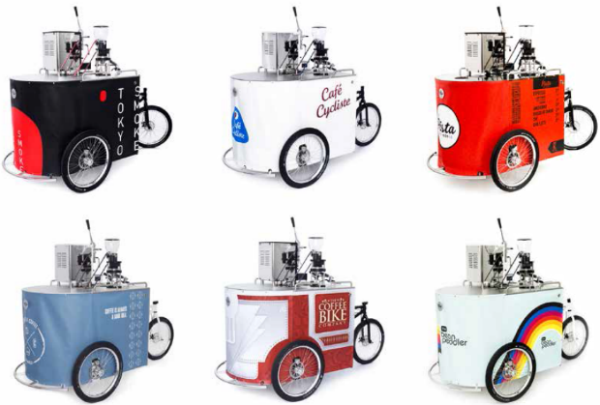 The Velopresso Cart is our answer to the challenge,” Amos added. It is this continuous development, and the on going design of accessories and companion products, that satiates Amos and Lasse’s desireto design, and makes the less exciting aspects of running a business more bearable. As a unique design and as a business, Velopresso has so much going for it. It has impact; it has a curiosity factor, mobility and cuteness; it ticks the sustainability box; andit picks up two trends currently riding high — coffee and cycling. It is the perfect storm in a coffee cup. Velopresso has worked with Breakthrough funding, a company that helps UK SMEs achieve R&D tax credits - a government scheme created to enhance and reward innovation amongst UK businesses. Could you be eligible? Click here to learn more.